Thanks to a combination of love and horses, a two-bedroom home in Studio City designed by architect/professor Kenneth Lind is available for $6,890 a month. And the owner has written a bit about the place on the listing site. Excerpts: "The House: an unusual design by Kenneth Lind, an architect's architect; aggressive modernism with a soft, prairie edge. Pierre Koenig was a student of Lind's... The house was photographed by [photographer Julius] Shulman and published when built." Then the owner lists all the stuff (the house comes furnished). "Furnishings: McCobb, Saarinen, Christiansen, Plattner, Neutra, Eames, custom and other vintage as well, lined Knoll drapes, miele, bosch, GE monogram, 6 burner thermador, art, etc. " So why are you moving, owner? This is what he/she writes: "It took 10 years to restore this house (by the team that won the LA Conservancy's Preservation Award). Then my partner and his 2 children came along, equestrians all, so the house didn't fit so well." The whole pitch is after the jump. If this is what you're looking for, this fully furnished home is pretty much best of breed. The Views: The house is designed as a U wrapped around a pool (bizazza tile) which sweeps under the living room wing, carrying the eye out to the Valley beyond. The end wings are transparent, so you can look either to the Valley or, from the bedroom wing, out to the Mulholland Corridor, Cahuenga Pass, Universal City and Griffith Park. The House: an unusual design by Kenneth Lind, an architect's architect; aggressive modernism with a soft, prairie edge. Pierre Koenig was a student of Lind's at the time he designed the house and said "everything I know about light and air, I learned from Kenneth Lind". 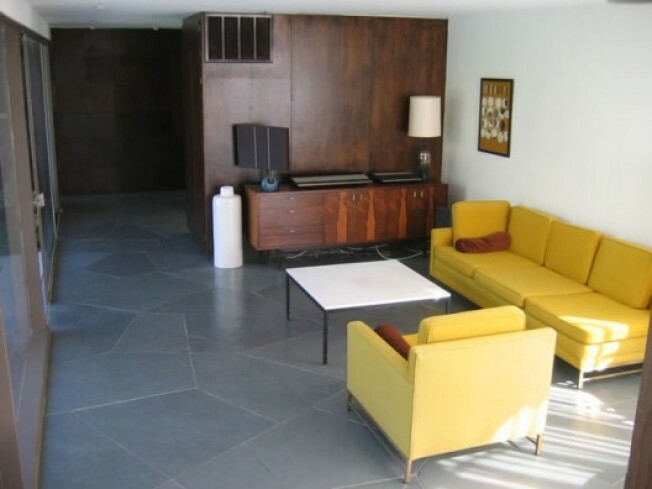 Of course, if you've ever seen Case Study House #22, Koenig apparently learned quite a lot (an original Julius Shulman of #22 hangs in the house). Walls of glass slide open to allow the outside to become part of the interior. The house was photographed by Shulman and published when built. The Location: cul-de-sac near top of first ridge as you enter the Valley, only 2 dozen homes, many celebrity owned (and rarely sold); if you've ever seen David Lynch's movie Mulholland Drive "the house" is 3 doors down. In the middle of everything and away from it all with no "windy-way-up-there" street thing going on. Studio City address (although if you want, you can go a little ways down Ventura Blvd and get a Hollywood Hills address, but it's more dense, tougher to access and the restaurants and shopping are farther...oh, and the prices are higher). Furnishings: McCobb, Saarinen, Christiansen, Plattner, Neutra, Eames, custom and other vintage as well, lined Knoll drapes, miele, bosch, GE monogram, 6 burner thermador, art, etc.